A classic model with a classic model! The “old gal” with the magnificent Rolls Royce Silver Ghost. So Sunday morning dawned and my dynamic crew opened the blinds to what seemed like idyllic weather conditions for tandeming – bright sunshine and little wind. Which was just as well on two counts – one being that the “old gal” doesn’t like the wind at all … mind you the “old git” is not too keen on it either as it always seems to be a head wind – and as my Captain, he seems to take the brunt of it! And secondly, the “old git” had decreed today would be a longish run, in training for Team Matilda’s forthcoming Tour de New Forest – now known as TdNF – but more of that later in this blog. Just after 10am we headed off towards Bridge of Earn – a scenic 14 mile undulating run across roads in rural Perthshire. You can check out the details of our route on Strava below – and don’t forget to click on the map image to be transferred to Strava to get the full data and statistics! First stage was an easy canter towards the village of Dunning, then on to Forteviot. My crew were enjoying their usual doze of fun and laughs on my saddles as the miles seemed to whizz past in idyllic conditions. Even a fairly tough climb out of Forteviot – featuring several hills – didn’t phase them as they battled on to the top. The reward for that climb is a great long downhill stretch in to the town of Bridge of Earn itself, with the “old git” reveling in his role as Captain – revealing that we were hitting the 30mph mark at several parts. As we turned into the Brig Farm Shop and cafe at Bridge of Earn, my dynamic crew were both amazed and impressed to find they had arrived in record time of 1 hour 02 minutes – marking an average speed of just shy of 14mph! There’s obviously life in this “old lady” yet! I must admit I do like it when we are whizzing along as it makes me feel like a young thing! 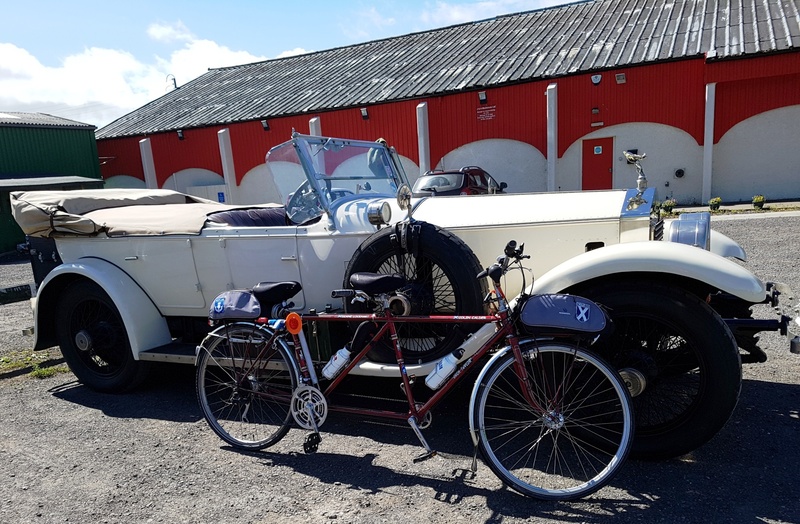 Time for a celebration scone and cake … but sitting in the car park was a beautiful classic car, a white Rolls Royce Silver Ghost. It seemed only natural for me, as a classic bike, to be pictured beside such a classic car! After all, we have similar sleek lines! Seems the car was part of The Round Britain Tour 2017, which is is a joint celebration of two important Rolls-Royce events. Firstly, it celebrates the remarkable achievements, 110 years ago, of the original Silver Ghost, AX201, in establishing a new world record of running without involuntary stops for a distance of 14,371 miles, almost twice that previously set by a motorcar. Spot the similar sleek lines! Here I am lined up beside the Silver Ghost. The other reason for the tour was to celebrate another occasion 60 years ago, when a few Rolls-Royce enthusiasts decided it would be a good idea to form a club. Formed in 1957, the Rolls-Royce Enthusiasts’ Club has resulted in a worldwide organisation, now in its Diamond Jubilee year. The “old git” trying (and failing) to look cool beside one of the coolest cars on the road! 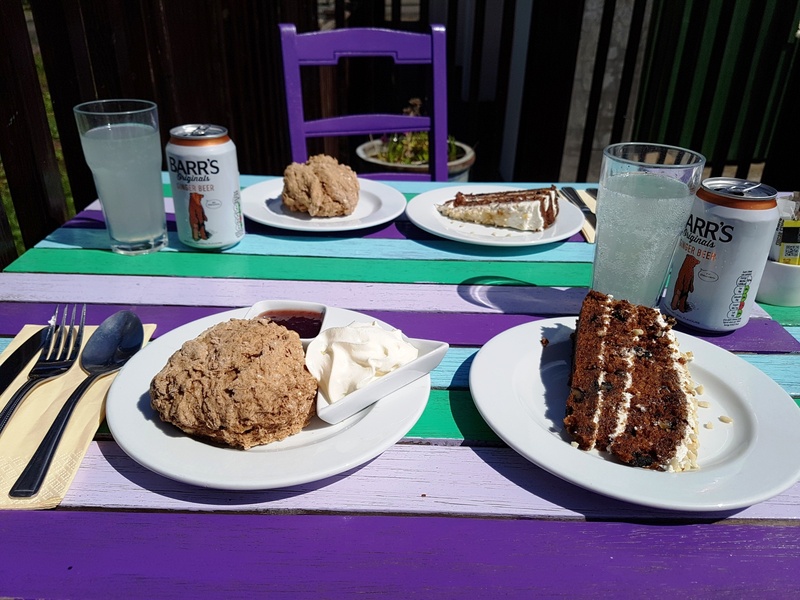 My crew then decided an alfresco refuelling was required and ordered up a spread of ice cold ginger beer, apple scone, and some carrot cake – the favourite of tandemers and in particular the “old gal” and the “old git”. All of which was yummy and consumed on the colourful decking area. Alfresco apple scone, carrot cake, and ginger beer. Perfect refreshment for tandemers! After a nice relaxing time in the warm sunshine it was time to head on the return journey. My dynamic crew were in happy mood after such a good first half of today’s route – but unfortunately, while they were indulging their taste buds – the wind decided to start blowing. And as we know, when there is wind, it is always blowing in an unhelpful direction. It was still pretty warm, but the “old gal” and the “old git” were now battling against a fierce head wind. 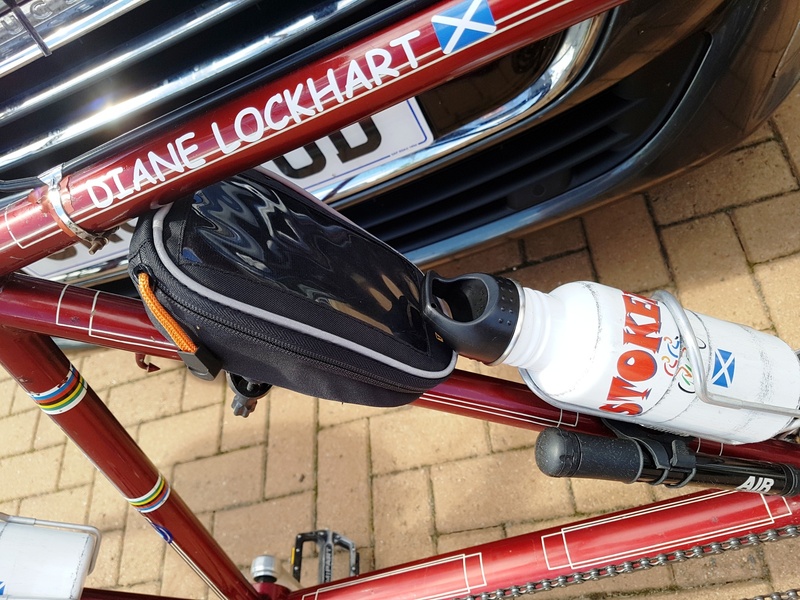 Now the road out of Bridge of Earn is a bit of a tough one at the best of times – a long slow grind of a cycle – but the head wind rendered some of the comments coming from my stoker’s position unrepeatable in what is after all a family blog! Let’s just say that the speed we achieved on the way to the cafe was not being achieved on the way back – and in fact at some stages we were lucky if we were hitting half of that speed. But they gamely battled on (well truthfully there was no alternative!) but the ride home only got more frustrating for my crew when we had a mechanical after the turning to Forteviot on the stretch to Dunning. My chain slipped off my cog and got jammed in my metalwork. More interesting words from my stoker – but top marks to her as in her role as chief engineer she soon had the chain problem sorted – but only after I had to be turned upside down, in an ungainly manner for an “old lady”. When we finally cycled in to the village of Dunning the temperature was rising and my crew were wilting a bit with the relentless pedalling again the wind. The “old git” had a brainwave moment and decided a brief detour into the garden area of the Kirkstyle Inn would be a good idea! I mean, he said it would have been rude to pass by without stopping! It would need to be said that the “old gal” thought this was one of the “old git’s” better ideas – it seems he does have a few! – and immediately ordered my Captain to go to the bar and order two tonics (with a good splash of gin in them!) to recharge my dynamic crew for the last five miles of the trip. The warm sunshine in the garden area belied the strength of the wind and lulled my crew into a false sense of security, So much so that when they got back on my saddles it was a really hard slog to get going and make any forward progress! At times it almost seemed Team Matilda was standing still – and it wasn’t for the lack of effort and power going into my pedals! After finally returning to Matildas Rest the “old git” had to take a couple of pictures in the bright sunshine of my snazzy new name decals – well to be strictly honest … its the names of my dynamic crew which are now emblazoned on my shiny steelwork! Don’t know why they couldn’t have got a Team Matilda one … but no, its obviously all about them! But whisper it … I do actually quite like them! And one thing is for certain – no one will need to ask my crew’s names again! The “old gal’s” name emblazoned on the Stoker’s section of my frame …. … and the “old git’s” name on the Captain’s section. Spot the snazzy saltire flags! A check of Strava revealed Team Matilda had registered seven personal bests along the way and eight second bests – much to the delight of the “old gal” and the “old git”. Perhaps not surprisingly all the PBs were on the outward bound half of the ride – before the wind got up! Strava officially recorded the ride as a distance of 27.7 miles at an average speed of 10.2 mph, with a top speed of 32.0 mph. The traveling time was 2 hours 42 minutes and the elevation covered was a not insubstantial 1,276 feet. We managed to burn up 1,554 calories, and produced an estimated average power output of 143 W.
So an ideal training run for Le Tour de New Forest – what’s the TdNF I hear you ask? Well I am getting uber excited as I am ticking off the days before Team Matilda are heading off to near Southampton in Hampshire to meet up again with my “best pal” – a tandem called Bluebird! Regular readers of my blog will remember last August my dynamic crew welcomed Team Bluebird to Perthshire. 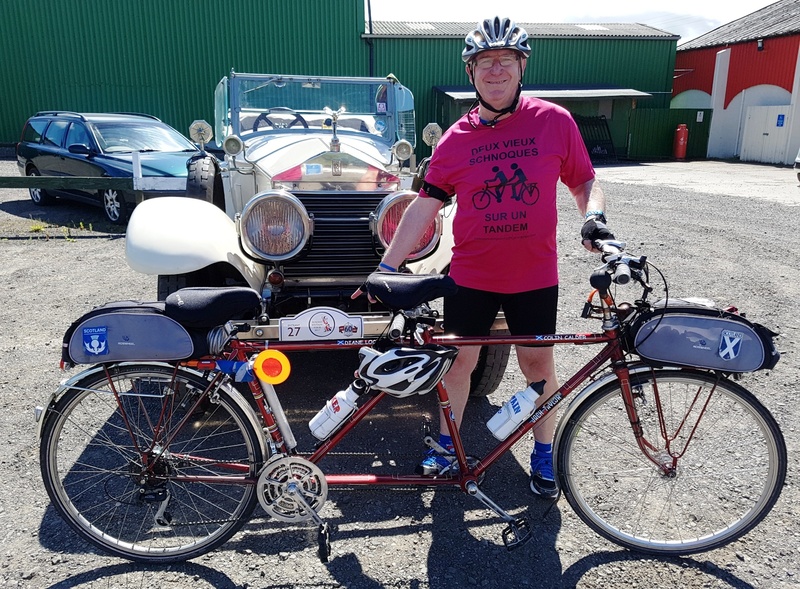 Team Bluebird are Jane and John Taylor who brought their unusual Pino semi-recumbent tandem north of the border for a fabulous week of tandeming which was called Le Tour de Perthshire. Me and Bluebird had a great time and we have quite a bit in common as she also has her own mini blog called ‘Travels with Bluebird’. Both tandems had a wonderful week, with lots of chats and fun! 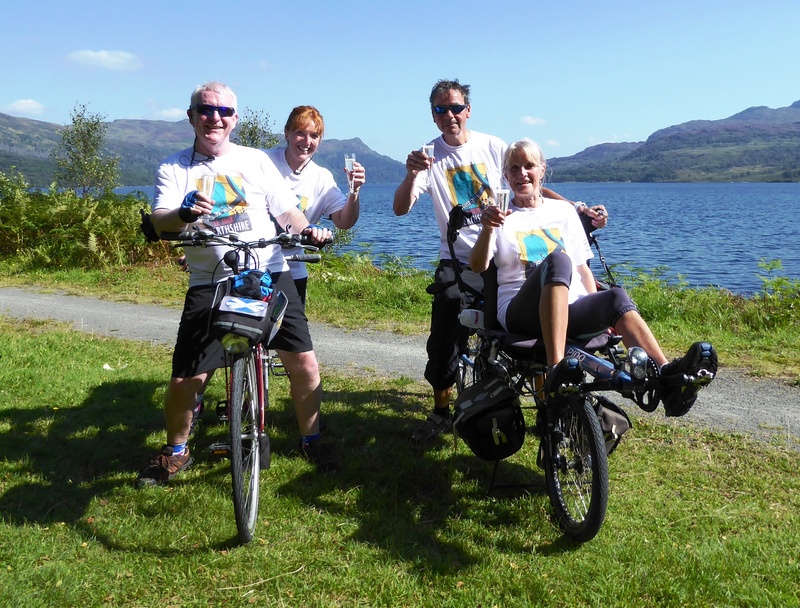 This pic sums up the Tour de Perthshire – fingers crossed for fab weather for Tour de New Forest. And the crews certainly seemed to have lots of fun and laughs too – in bright sunshine. 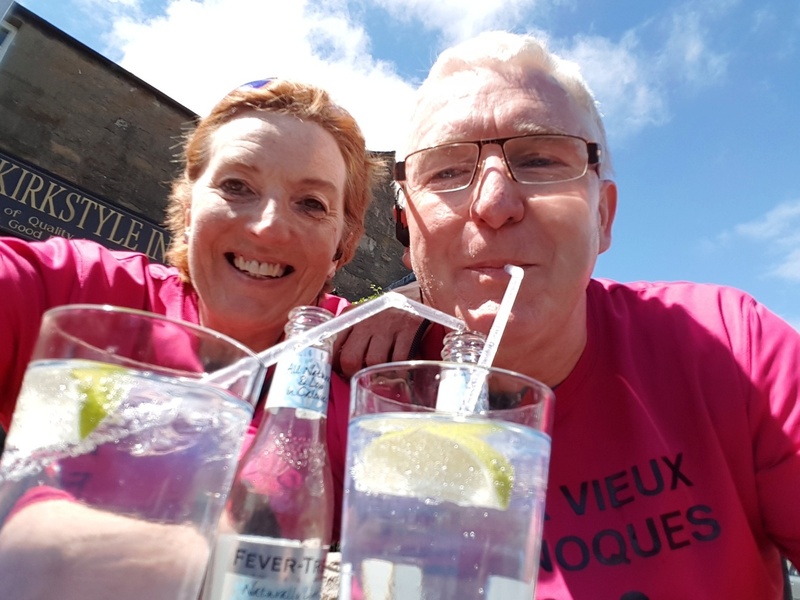 Jane and John certainly seemed to have lots in common with my dynamic duo – such as not enjoying hills and definitely enjoying wine! In fact both Team Bluebird and Team Matilda seemed to have the same views on not taking tandeming too seriously. To emphasise that point the four crew members all decided they would become self-proclaimed founding members of the Nutty Tandemers Club! And that definitely set the tone for the week – and gave us all a crazy reputation to live up to! And I can say that over the week all four tandemers more than passed the test to be life long members of the Nutty Tandemers Club! Check out my blog of the week’s fun and frolics to see what kind of things we got up to! 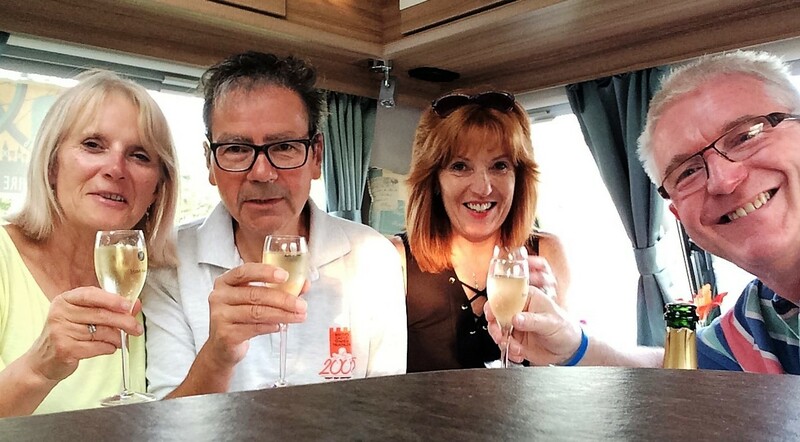 I feel confident there will be one or two prosecco toasts during the Tour! This included my dynamic crew playing a key role in helping Team Bluebird develop a likeing for prosecco, and indeed Team Matilda’s infamous prosecco picnics! So I am sure my la bouclee wine carrier will always have a bottle in it during the TdNF! And to make the trip even more exciting John and Jane have added not one, but two tandems to their stable of bikes since last year. 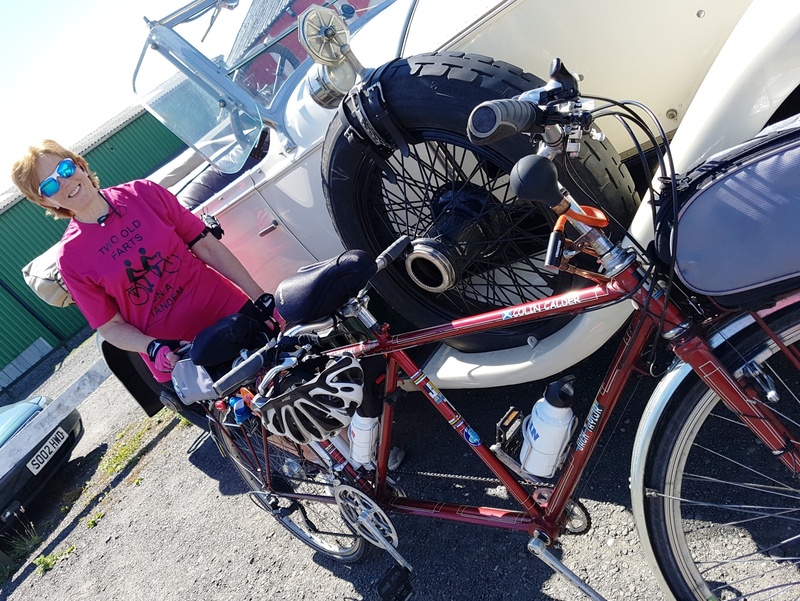 They have added a vintage tandem called Henry and a tandem that easily comes apart for travelling called Siggy – so it promises to be an interesting week. Whisper it, but I am told that Henry is a bit of a charmer of a gentleman tandem … with an eye for the ladies of similar vintage! So you never know he and I may just have a little bit of a holiday tandem romance! But I will have a good chat with Bluebird to make sure she approves! ← Muthill Sportive 2017 yellow route with sub stoker! Hi there Matty, great to hear your hill climbing is still in fine fettle….even if its on carrot cake and ginger beer. You’d think the old dears would know your taste by now. I see they managed to avoid having your name emblazoned on your cross bar (aptly named I think)! You should think up some testing routes for the New Forest to get your own back, for example a whole mile without a pub ! That would teach them ! Ah Dot! You have returned to commenting on my posts! You have been missed! Especially with your supportive comments! 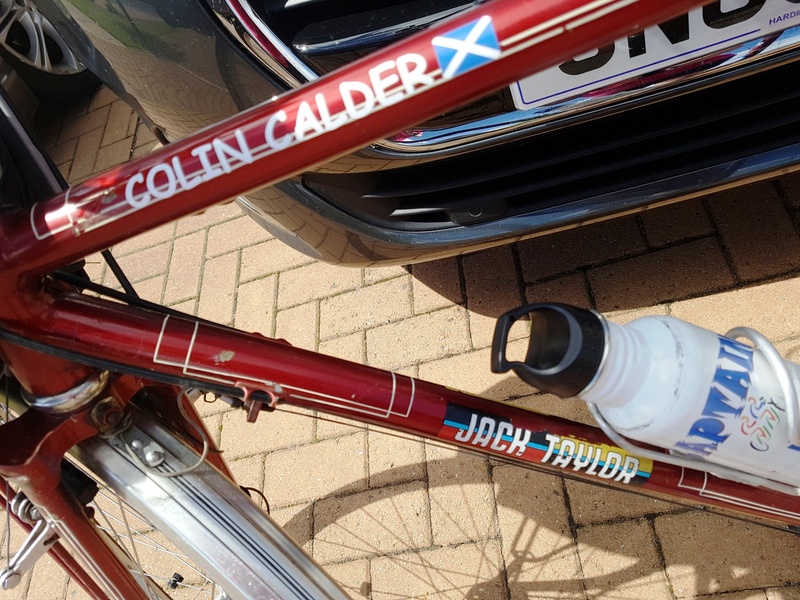 You know I think you may have persuaded the “old git” to order up a set of decals with my name on it now! I am sensing there may be a few pubs involved in Le Tour de New Forest! Not long now Matilda, glad you have been in training mode for your tour with the southern branch of the NTC. B,H and S are all ready to welcome you to their garage and to show you, and your crew, the delights of their area, quite different to your area. But be warned, the wind can get you here as well, good weather has been booked but no confirmation has come through. Safe journey in your transport, we will all see you soon. Jane …. me and my dynamic crew are confident your order for good weather will arrive to allow for prosecco picnics! I mean after TdP you guys have a lot to live up to! Team Matilda can’t wait! Oh Skelbo Cyclist I can assure you that the Nutty Tandemers Club is a very appropriate name indeed for my dynamic crew and the crew of my tandem friend Bluebird! Team Matilda is looking forward to exploring a totally new area to all of us! And am sure the “old gal” and the “old git” will put on a good show for Scotland with the prosecco et al!